Will We See Tyler Webb in 2015? Even after all the moves they’ve made this off-season, as it stands, the Yankees should have one open bullpen slot on the Major League roster come 2015. Now, they could go out and sign a one-inning closer like Casey Janssen or Rafael Soriano (can we handle another year of untucking shirts? ), but right now, it would seem that after Andrew Miller, Dellin Betances, Shawn Kelley, Adam Warren, Justin Wilson and Esmil Rogers, the Yankees would be content to let some kids, or perhaps some non-roster invitees, battle it out for that last spot. Can Tyler Webb be one of those guys? Let’s get to know him a little better and evaluate his chances. 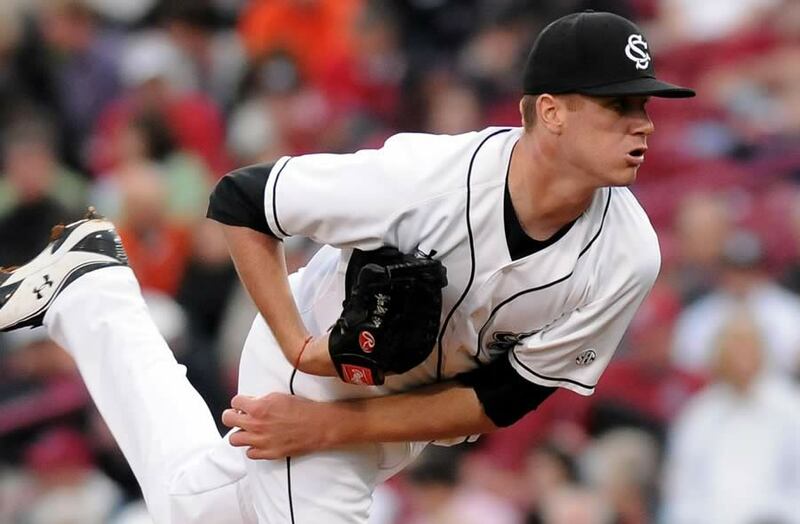 The Yankees drafted Webb, a 24-year old from Nassawadox, Virginia, in the 10th round of the 2013 draft. He began that season in Staten Island (low A) and ended it in Charleston (A ball). He used last season to climb much faster up the minor league ladder, starting out in High A Tampa and finishing all the way in AAA Scranton/Wilkes-Barre, and knocking on the door for a Major League Job. Thus far in his two professional seasons, Webb has amassed a 6-7 record with a 3.63 ERA, a 1.087 WHIP, 15 saves and 142 Ks in 104 innings (12.3 Ks/9). The scouting report is fairly simple for Webb. First of all, he’s a giant at 6’6″ and 225 lbs. He does not, however, throw 400 mph, as you might think a man of his size would. His fastball really only sits in the 90-92 mph rage, and his curve ball comes in in the 70s somewhere. He’s basically a LOOGY, and nothing more, as he held lefties to a .216/.264/.353 slash line with a 40.5% strikeout rate. He also uses some deception in his motion, which helps him even more against left-siders. Like I said, he’s probably just a LOOGY (although he has had success against righties in the minors as well), but that can be a very useful thing on a Major League Roster. As far as 2015 goes, I think Webb will start the season in AAA. The Yankees already have two lefties on the roster in Wilson and Miller, and I don’t quite think they need to use that last roster spot on another LOOGY. I’d rather they find a guy that can get out people from either side of the dish, and call up Webb later in the season when they need an arm. We won’t see Webb in April, but I’m fairly certain we will see him at some point in 2015.